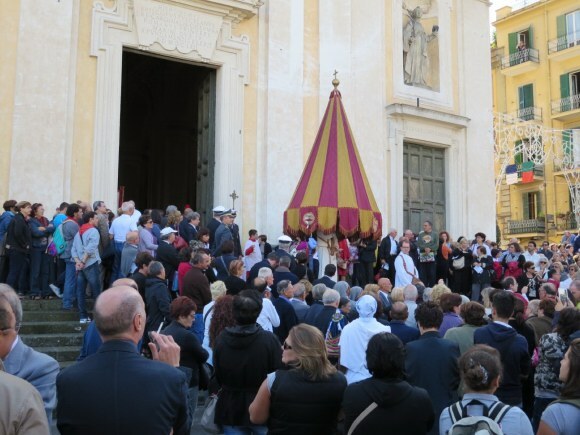 On the first weekend in October the town of Marino, 60 minute train ride from Rome, celebrates the Festival of the Grapes. 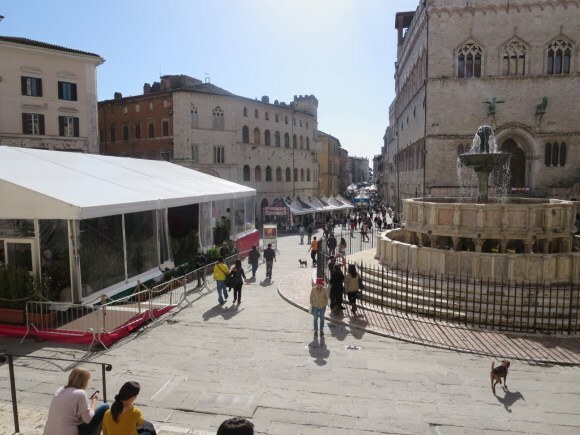 They take the main fountain of the town and convert it from water to wine and you take your plastic cup and take as much wine from the fountain as you want. The festival is at the top of the hill top town and the walk up from the train station is the hardest part of the day. We got there early last year and we were the first ones in town again this year. The town gets too crowded later in the day. 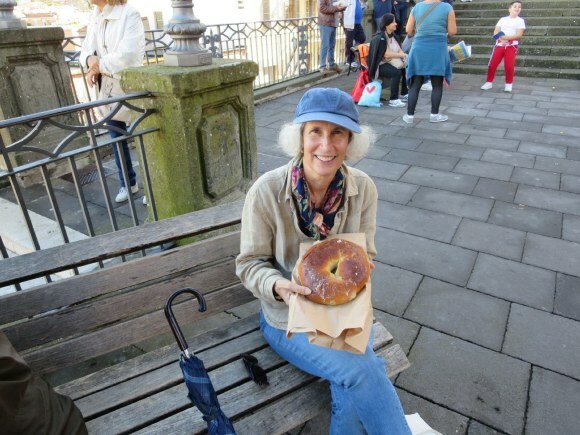 They have a special pastry for breakfast called a ‘ciambella’ which is a large donut like thing made with wine, grape skins and raisins and you can buy two of them and all the wine you want for 1 ½ euros. The Queen is shown with her ‘ciambella’. 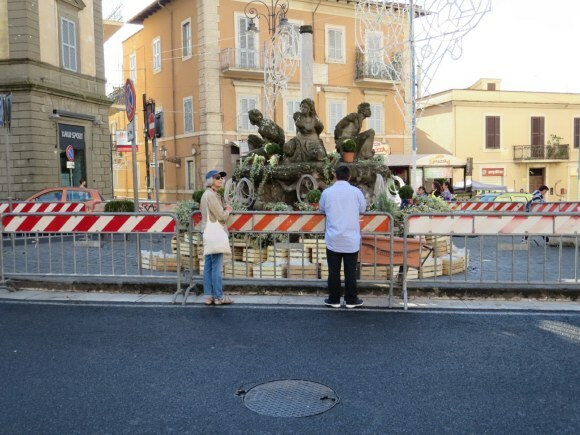 They have just started to put the grapes and hoses on the main fountain of the town. 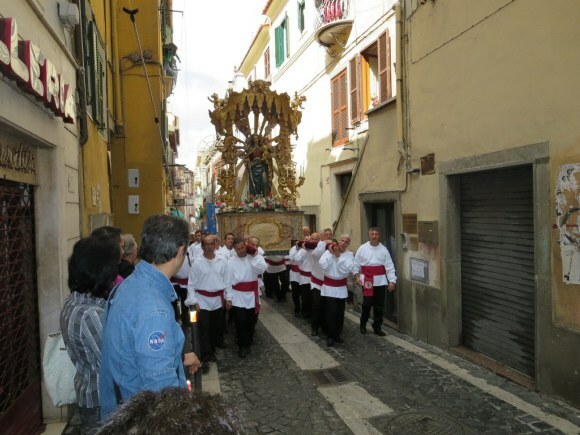 The festival includes a parade through the center of the town before the annual blessing takes place. After the service in the main church they leave with all sorts of huge crosses, tapestrys and other umbrella like things that are paraded around the town. 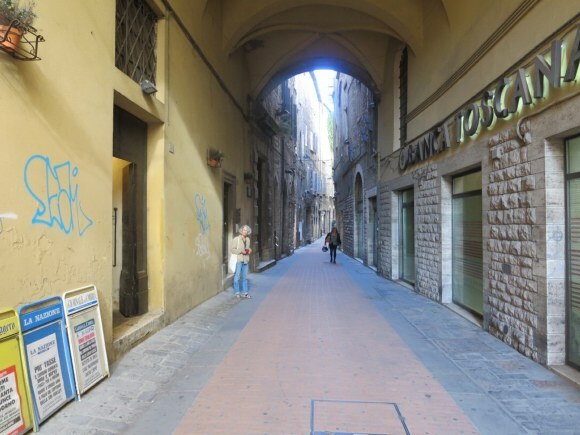 The streets are narrow and the objects are heavy and it is hard to maneuver. 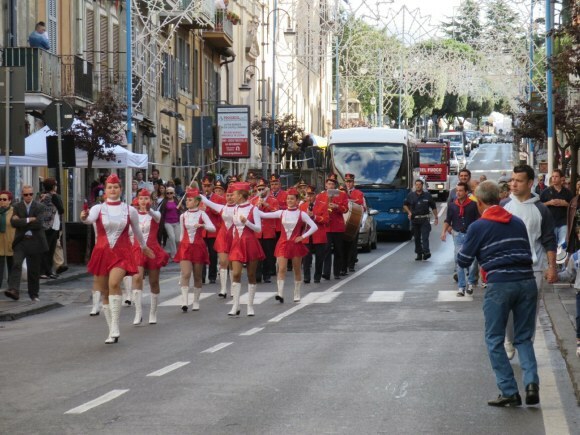 A lot of the youngsters in town get dressed up and participate in a procession around the town. 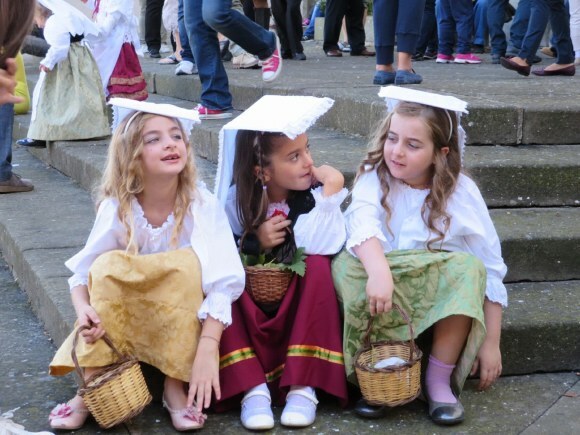 Pictured are three of the young girls. 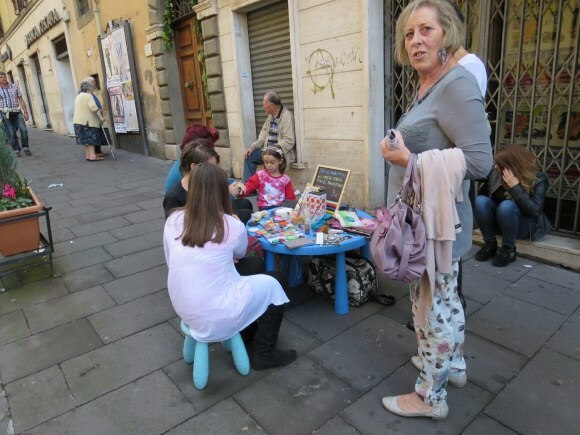 This enterprising young lady set up a face painting table right on the sidewalk. 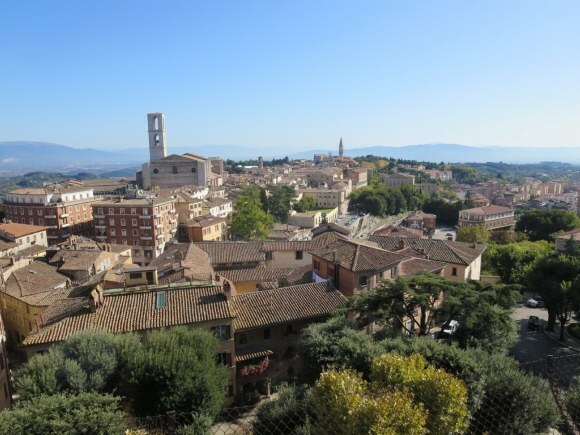 Every year the city of Perugia, about two hours north of Rome by train, hosts the EuroChoclate Festival. 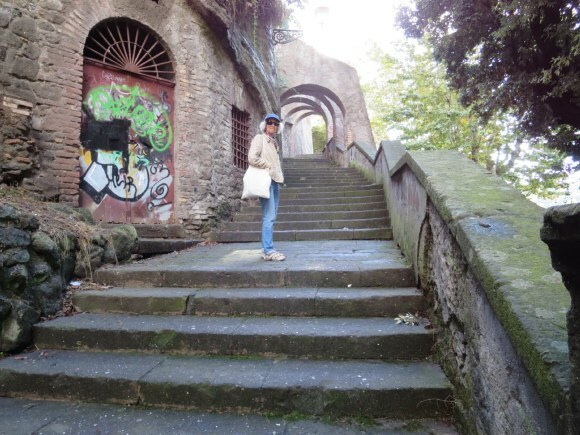 The one time we had been to Perugia we arrived the day after the festival so this year we decided to go. 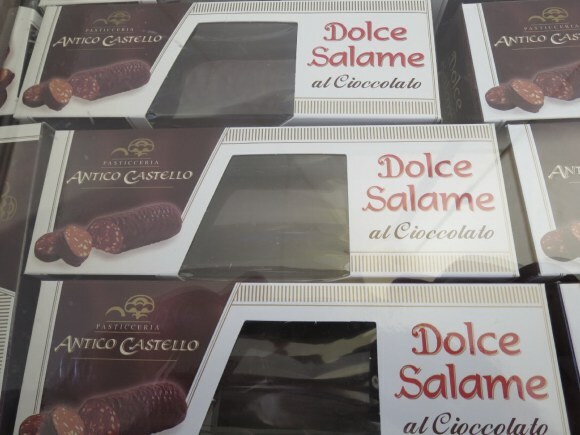 There were about 100 booths selling all kinds of chocolate like salami dipped in chocolate and chocolate kebabs. There was even chocolate pizza. 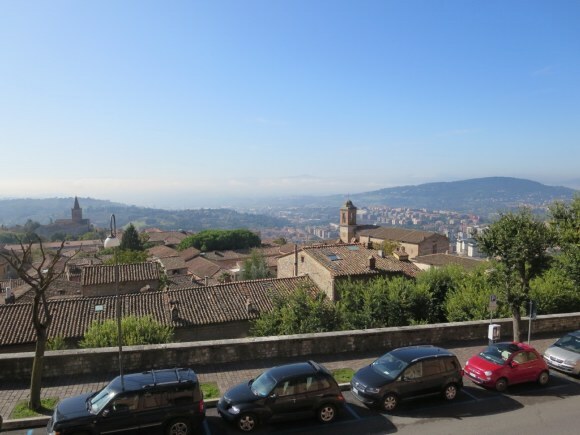 The view from the top of Perugia. 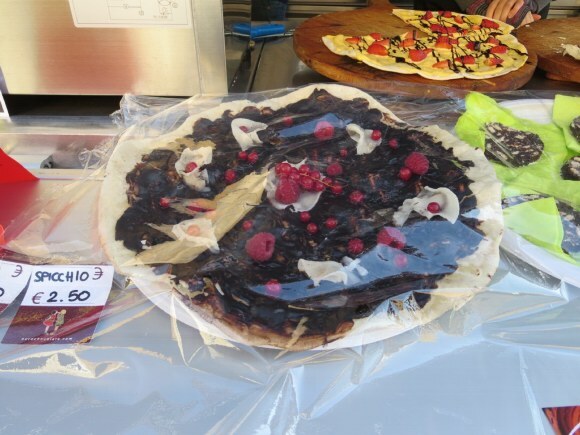 Pizza at the Eurochocolate Festival. 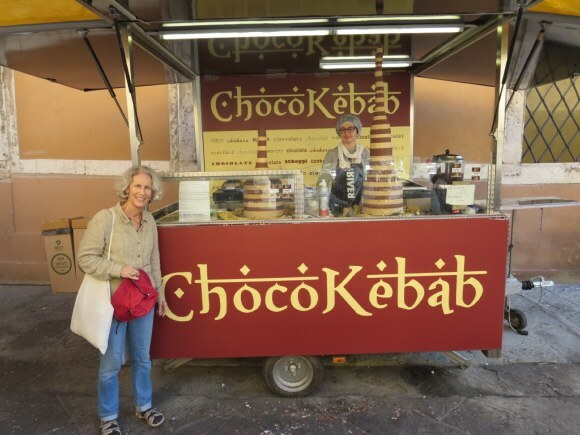 The Queen at the ChocoKebab booth. The city was crowded but one block off the main 'chocolate' street it was fairly empty. 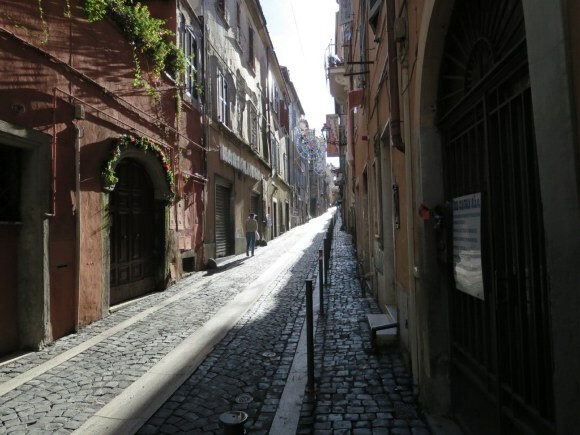 Frascati, located 12 miles south east of Rome, is a town that has been occupied since at least the 5th century BCE. It is a grape/wine producing area and remnants of wine equipment from that time have been found. 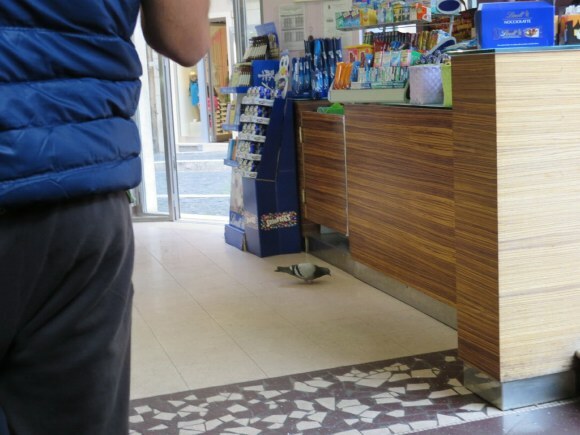 Morning Cappuccino: One day a pigeon wandered into a bar…. 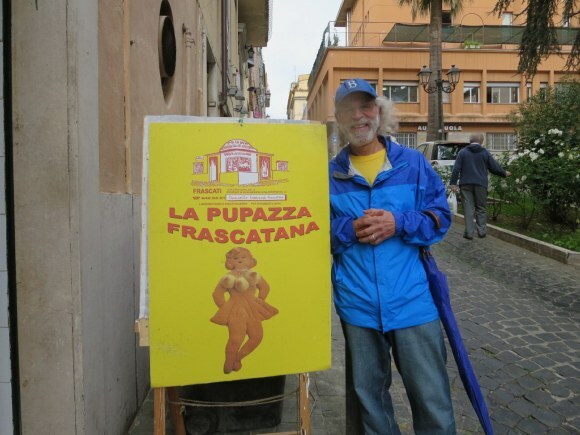 Frascati Pupazza: We took a train to the hilltop town of Frascati which is known for its wine and one other thing – the famous Pupazza or cookie shaped like a woman but with three breasts. They are sold all over the town. We went to buy some for gifts but they are 5 euros each so we settled for this picture. 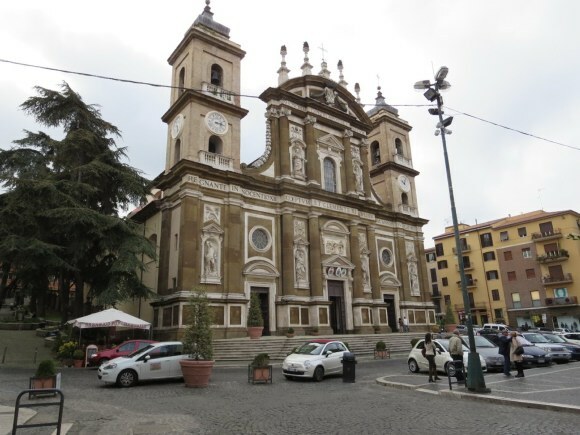 Church: The Cathedral of St. Peter the Apostle was built in 1598 and was completely destroyed in a bombing raid in 1943 as was 50 percent of the town. 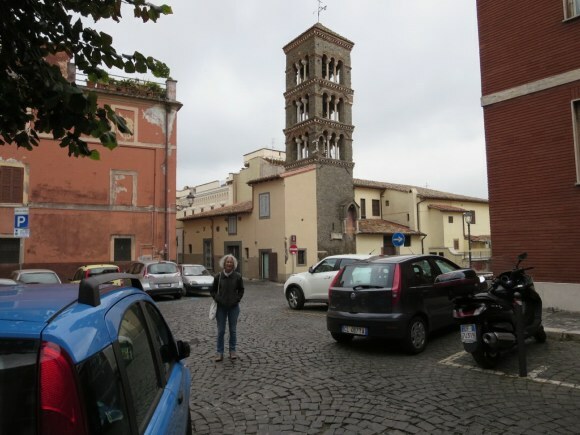 Campanille: The date on this bell tower in Frascati said 1305. 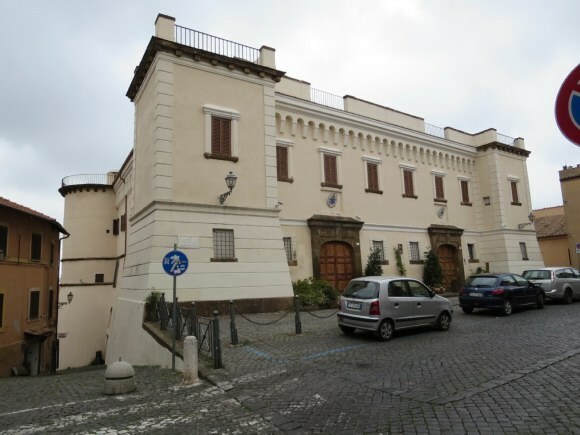 Villa: Frascati was obviously a town for rich folk. This is one of several old villas located in the town. I suspect these were summer homes for people from Rome. 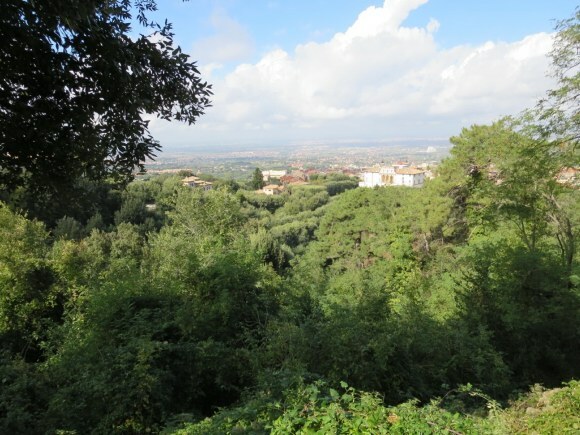 Villa Aldobrandini: Still property of the Aldobrandini family, it is known as Belvedere for its location overlooking the valley toward the city of Rome. Built in 1550, it was closed the day we were there so we could not tour the villa or the gardens which are supposed to be spectacular. 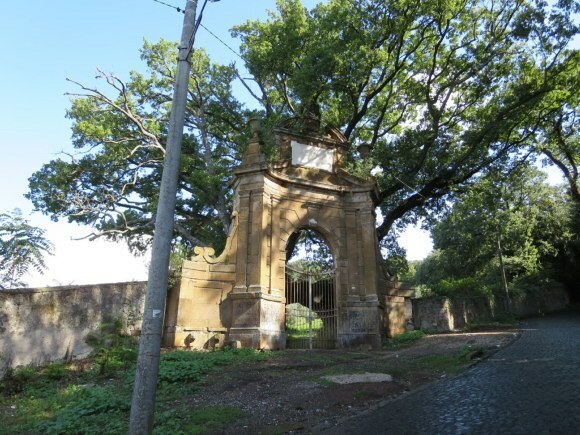 Supported Trees: There was an abandoned, fenced in villa on the top of the hill that had a massive tree right inside the gate. 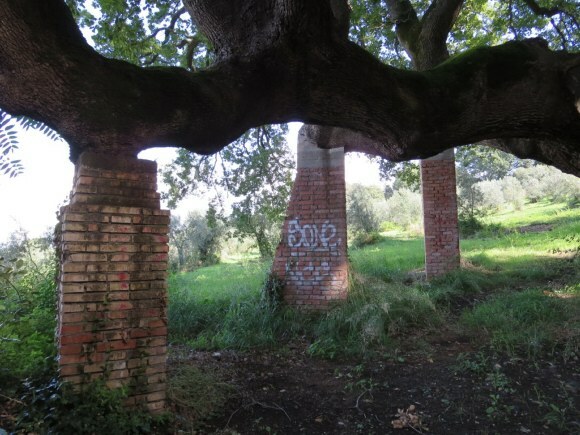 In order to keep the tree from falling they had built large columns to support parts of the tree. 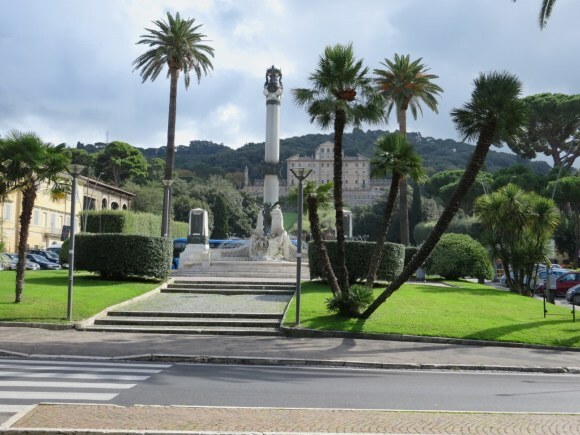 View: On a clear day you can see Rome.